The wooden church of the Virgin Mary (Lappeen Marian kirkko) is one of the attractions of Lappeenranta and architectural monument of the 18th century. 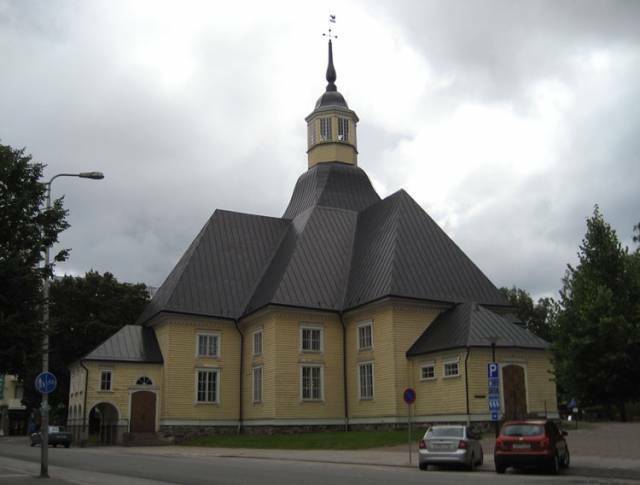 The church is located in the center of the city, at the intersection of Valtakatu and Kprkkokatu streets. Address: Valtakatu 35 / Kirkkokatu 11, Lappeenranta, Finland (near the shopping center "Iso Kristina"). In 1790, during a fire the Old Church located in fortress was burned down. In this regard, it was decided to build a new church on the outskirts of the city (almost in the forest). Construction of the church began in April 1792. In December of the same year the church held the first worship service. The church was consecrated on 21 June 1794. Finishing work inside the church building was completed in late 1795. Bell tower of the church is a little south-west of the church, next to the cemetery. This is the only surviving building in Lappeenranta, built in the Gothic Revival style. Construction of the bell tower was completed in 1856. In 1847, the church received a donation in the form of valuable crystal chandelier. In 1890, the church organ was installed. Currently set in the church organ was installed in 2014. Somebody tried to set fire to the church in 2008, on the night of 5 to 6 January, but fortunately the attempt failed. The church several times been repaired. The church is open in summer 3.6.-11.8. Mon-Sun 10-18. Organ music can be heard on Wednesdays 5.6.-21.8. 12-12.30.